I do really like the game but every time I do the party after you get your second skill.I don’t know why but I can still do other events like I can “become heart’s desire “ and if there is a way to end a party please let me know. Final thoughts:great game for any one looking for a life situator. I decided to try to play this game again after about a year. I quit playing after it was too boring and repetitive and I could never EVER finish an event to get new careers and heirlooms. You guys make it almost impossible to get new game play and finish the tasks. Long events, 22 ridiculous tasks and a buttload of sim cash is just too much for a small reward. I love the sims and have played on PC since the beginning but, I just can’t do this anymore. It is so boring and I lose interest after I work for 3 days trying to get a new hobby or career and I don’t ever finish. I’ve got a house full of sims and still can’t beat the time limit? Come on guys this game is so boring and all you’re doing is taking as much money as possible. Disappointed to say the least after so many years nothing has improved. Love this game so much that I am obsessed with it I play it almost every day and I can’t just delete it because I love it it is so much fun. I would recommend this game to anyone who wants to play virtual games because it is so much fun. I’ve been playing this game for at least a year now and I’ll admit, it’s not the most fun game out there but it’s great for wasting time. One major problem I have is that the game crashes at least three times before I can even play it. Also, when I make my sims more overweight, they’re just skinny again whenever i log back in. I was severely disappointed when the latest update did absolutely nothing to fix this. While I’m here, I guess I’ll talk about other possible improvements. First of all: Llamazoom ? Get rid of it. The only way I can even come close to finishing all the tasks is if I start longer events super early and stat attached to my phone all day. There should be an easier way to get Fashion Gems, SimCash, and Cupcakes without paying actual money, and it would be great if we could actually sell items we don’t want/need. Also, giving the Sims actual needs would be nice because being able to just make them work all the time feels unrealistic and just unlike a Sims game. A lot of people have suggested adding pregnancy and pets, and although I agree that those would enhance gameplay, please fix all the glitches before trying to add any new features. This game used to be really fun ! Now it’s just tedious and annoying. Graphics to good graphics and quality so addictive! This is my favorite game. I’m addicted and I never want to stop playing!! Can you bring steamy hot tube back I really want to get one,thank you that’s all. I looooove this game! I like the careers! Keep up the good work! Don’t get me wrong. I LOVE this game. I just have a few concerns, that’s all. 1) Energy: It takes WAY too long to get more energy. 3 minutes= 1 energy (point?). 2) Events: It’s also the events that get on me. Sometimes, when doing quests, I enter an event. And it’s frustrating because it takes a LOT of energy and SimsCash to get through it. What I ask is, maybe 1 minute= 1 energy (point?) and that maybe the events can be just a little shorter. Thank you! The game was more fun, you don't have enough time to finish quest. You used to be able to finish to llama quest. Now, they are way too long. This game seems to be money hungry. Also, babies-adults are glitchy. So my sister has a 💻 and I have a iPad and a computer 🖥 that looks like that up top but not the MacBook it’s a Mac but Not the flat one so yeah and also she downloaded mods but yet I don’t know what mods are but when I was playing and my sim took a shower I saw her naked so yeah btw someone write a review and tell me how to download mods on the sims and the sims 4 thx.love you all. Good news! I love this game! It has great new updates and a lot of things to do. The character trates are very useful. I have never had a problem with the game until I wanted one of my sims to have a baby with her spouse. Bad news. I had to complete the baby quest. It was fine up until the events where 7 hours long and you only get 2 days to complete it. I don’t have a lot of WiFi at my house so I’m constantly having to redo the baby quest and never being able to complete it. I think the quest makes the game less fun because it takes up so much time for your character. I get that you have two but I mean come on. please make it longer or have the events shorter! (or even better take it off!) Also I think adding pregnancy would make the game more realistic and having pets would make it more fun. I hope you’ll take this into consideration because overall I think these things will make the game better. i get that llama zoom is a great way to get players to play the game more as it makes you do more “quests” (tasks), but really it’s such a hassle sometimes. i used to like the game a lot, but the llama zoom made me grow to dislike it. maybe make less people do less tasks? i also suggests adding more hobby stories to the game without acquiring the heirloom. i’ve been playing since game came out and never have i ever received the a rare heirloom which makes me quite frustrated. i’m closed to reaching level 50, and maybe after that, if there’s no improvements, i might actually quit the game despite paying with real money for some deals. Zero communication with community. Constant reminders that the player is unappreciated. Everything, everything is geared towards nickel and diming the player. Fraught with server issues. 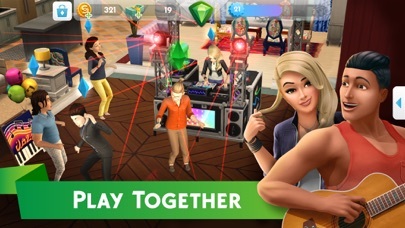 Waste of time to download, as it’s become clear amongst the various Sims communities the mobile version has been “shelved”. I altered my sims body on the dna tab, after saving I left the app. When I came back my sims body was back to default. Please fix this because it’s taking away my sims appearance. Bad. It was awful. A total waste of time. I love this game! But can you add pregnancy please? Just the pregnancy and pets, I think it will make the game a little more realistic and fun. Thank you for reading and I wish you a good day! I have been playing thise game for months now, and the whole cencept is very fun. The avatars are designed well, the houses you can create are beautiful, too. It's a pretty fun game, but I do have some suggestions. 1. Long events, not much time When we get limited time tasks to complete, for example the Baby task in order to have a baby or adopt, the game gives us like 2 days to finish all 15 events, most of which are 7 hours long. I can't be playing this game that much to finish all the tasks in time. Either give us more days to complete the tasks/events, or shorten the event time. If I try to helpmy Sim complete the event, then my energy only lasts so long. This leads me to my next complaint. 2. Energy Sometimes I will be doing an event, and I'll almost have finished it, but then I run out of energy and have to wait that entire hour instead. I just think it is unfait that we either need to use cupcakes (which are not easily accesible Use like 88 Sim Cash, which you have to wait to get and save it up. Even if I am saving it up, not everyone has it saved to 88 or more, and I dont aant to have to waste so much Sim Cash just for energy. The only other way to get energy is pay, which as a teenager I already do not have much of, and I dont want to be spending it on a game. I know you can also use appliances like the bed, shower, bathtub and toilet, but the waiting time to use those is really annoying, especially for the bed. Why can't we wait like 6 hours instead, or 12 maybe even? It’s boring and really repetitive. And tasks can take up to 12 hours to complete. And every EA game just wants your money. Get the computer version, it’s much better than this. This is such a fun game. 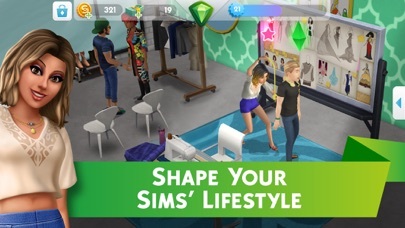 And I love that if You don’t have the sims 4 that you can have the sims mobile for free! And you can Do so such stuff on the game. 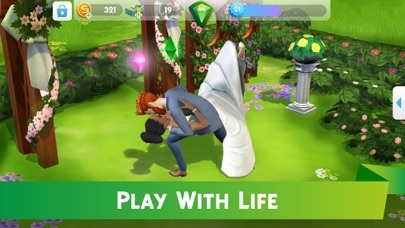 I thank the person who created the sims mobile. It’s like the females don’t have bottom lips, all the lip options for females there’s no bottom lip, but all upper lip, but when you go to make a male, there lips are fine. Absolutely terrible. Can’t do any of the events because even tho I finished the lama zoom on time and started the next task when I go on again it says I never did the lama zoom and I need to wait 4 more hours to continue but the timed event will be over by them what bull💩 is that???? So I actually enjoy playing this game and all the quests it gives but how do you take a fricken wall down? I’ve played the sims since i was 8, and i played the sims 3, cats and dogs on my old playstation 3!! Now, i play The Sims 4 with cc and all the expansion packs, while still trying to collect the stuff packs and game packs! 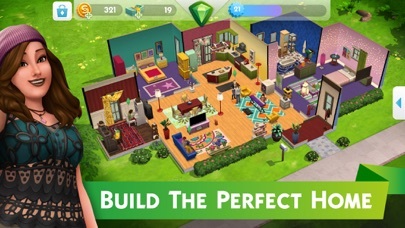 This game is the sims 4 pushed into a phone to carry around your pocket sized world! I strongly recommend it. I think overall it’s pretty good.... i think some things might need to be fixed but they are not that major and they don’t get in the way of the game. Outside of that the game is pretty great. Love how you can create your own little family and have kids. I hope you enjoy this game and hope you play this game!!! 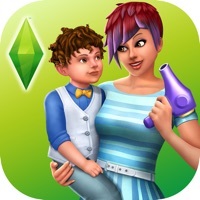 I love sims it’s the bestttttttttttttttt!!!!!!!!!!!!!!! This game is the best I play it all the time with my sister. Btw:Sorry that it was short. Game constantly freezes and closes out. I’m trying to complete an event but the app won’t stay open over a minute. EA has been slacking the past few weeks and sadly it’s pushed me to delete the game completely. 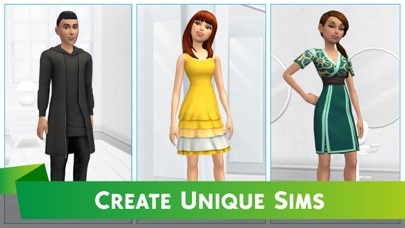 Changing it so you have to buy each color of an outfit or hair color is a rip-off. It was so much better before. There is not enough time given to complete the limited time quests. I used to be able to finish them on time but that hasn’t happened in a long time. Typically I get to the last part with about an hour left in the quest, only for the part to be two llamazooms or something else ridiculously long. If we are given tasks that are excessively long, then we need more time to finish.